Although we love teaching in our great little professional kitchen at Rocket Restaurant Supply in Berkeley; our pop-up cooking school, The Field Kitchen, was named because we also offer the unique experience of cooking classes outside on farms and ranches in the San Francisco Bay Area. After seeing how our Farmers’ Market tours inspire students with authentic farm-to-table connections, we took the idea a step further to develop table-to-farm classes that provide the opportunity to cook a meal together at the places where our food is grown and to meet the farmers, ranchers and food artisans behind the ingredients. On August 6th, we held a Farm Class at Achadhina Cheese Company in Petaluma. A fan of the company’s cheeses since I started sampling them at the Grand Lake Farmers’ Market in Oakland, I became friendly with the cheese seller earlier this year. He encouraged me to reach out to Donna and Jim Pacheco, who along with their four children, produce the award-winning cheeses and care for the goats (or “the girls” as Donna calls them) that provide the milk. The Pacheco family has owned Achadhina, named for the town in Portugal where Jim’s father was from, since 1969. After operating as a cow dairy for almost 30 years, Achadhina transitioned to mostly goats in the late 1990’s. In 2001, Donna taught herself how to make cheese and by the following year, her signature Capricious (a dry, nutty goat’s milk cheese with a texture similar to an aged Parmesan) had won Best in Show from the American Cheese Society. Now, the company makes several different kinds of cheese including Broncha, a mild table cheese; a fresh chevre; a sea-salt brined feta; and cheese curd with various flavorings such as herbs, garlic and crushed red peppers. The day started with a tour of the cheese plant and the aging room, where Donna pointed out the cooking table and explained how rennet is added to pasteurized milk and how the curds are next drained, cooled, rolled into bundled and then pressed overnight. Much of the process is done by hand. The aromas inside the building were earthy and funky in a good goat-y way. We were all impressed by the beautiful aging room filled with large blocks of Broncha and Capricious cheese that looked almost like loaves of bread with a thin layer of mold. Next, we visited the animals including a special detour to see the pigs that the Pacheco family raises for themselves. Each of their kids receives his or her own pig as a high school graduation present! We learned that the animals regularly enjoy brewers’ yeast, which Jim buys from local breweries. While the yeast is a nutritious source of protein and vitamins for the goats, if it is not carefully rationed the goats will indulge and become tipsy. Who can blame them? After slicing, dicing, mixing, grilling, frying, and much nibbling on cheese; we set the table, opened the wine, admired the colorful platters of food that we had created, and then feasted together. 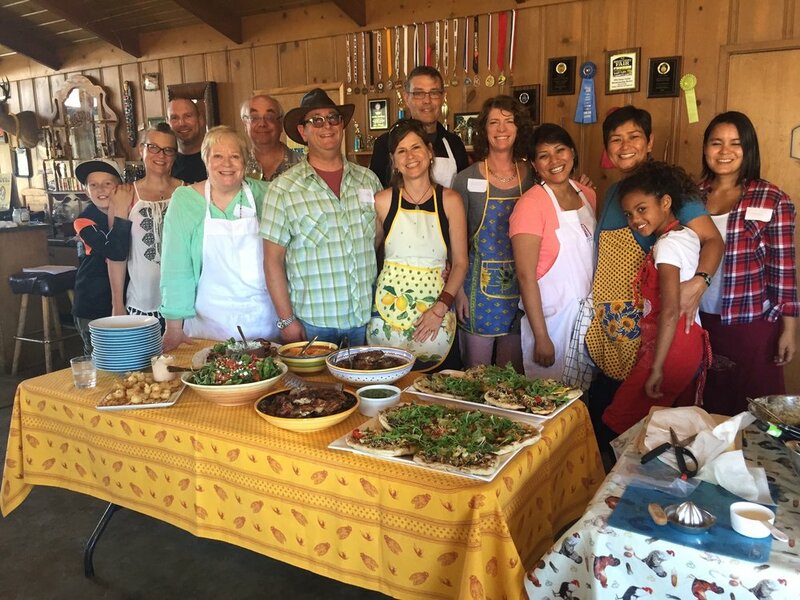 Thank you to Donna and the Pacheco family for sharing your story and your wonderful cheeses with us, and to our students for joining us in Petaluma for such a fun and memorable day of cooking and eating.